KLINGERSTOWN, Pa. – Sunbury Press has released the 4th edition of Max Klinger’s The Descendants of Johann Peter Klinger and Catharina Steinbruch. This book details over ten thousand descendants of Johann Peter Klinger and Catharina Steinbruch – most of them from the Pennsylvania Dutch region – including most of the prominent families of the historic Mahantango Valley. The origins of Klinger’s Church and Klingerstown are discussed as well as numerous photos of historic homes and gravesites. This book is a “must have” for anyone interested in Mahantango/Lykens Valley history or genealogy. Max E. Klinger, born and educated in Pennsylvania (B.A., Gettysburg College, J.D., Villanova Law School), has been collecting family history information for many years. A love of the outdoors drew Max westward, first to Colorado, and then to Laramie, Wyoming, where he now makes his home. In addition to genealogy, Max’s interests include astronomy and a variety of outdoor activities. Max is a retired tax attorney. READING, Pa. – Jan. 13, 2017 – PRLog — Sunbury Press has released 13 Deadly Endings, Thomas Malafarina’s short story compilation. Not all stories have a “happy ending”. Sometimes the forces of evil are just too strong to allow the characters, whether protagonist or antagonist, to survive unscathed. Sometimes it is because of revenge or sinister forces or simply bad Karma. 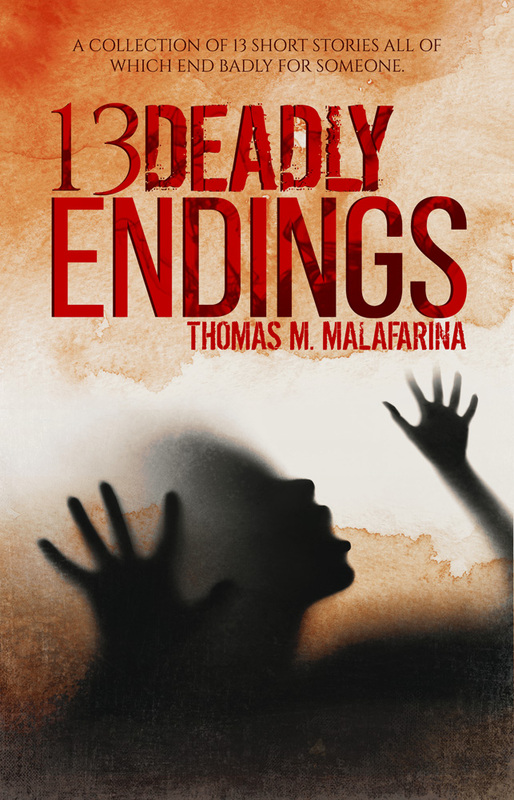 Welcome to “Thirteen Nasty Endings”, a collection of short horror stories by Thomas M Malafarina. In this disturbing world of terror and foreboding, virtually every story has the potential to end badly for someone. There will be no “happily ever afters” in this collection! This is definitely not a “feel good” compilation. Thirteen Deadly Endings guarantees that someone, whether deserving or not, will get it in the end. Thomas has put together an incredibly upsetting anthology of some of his most gory, horrifying, disturbing and bizarre tales for your reading pleasure. Thomas M. Malafarina (www.ThomasMMalafarina.com) is an author of horror fiction from Berks County, Pennsylvania. To date he has published six horror novels “What Waits Beneath”, “Burner”, “Eye Contact” , “Fallen Stones”, “Dead Kill Book 1: The Ridge of Death” and “Dead Kill Book 2: The Ridge Of Change”. He has also published four collections of horror short stories; “Thirteen Deadly Endings”, “Ghost Shadows”, “Undead Living” and most recently “Malaformed Realities Vol. 1”. He has also published a book of often-strange single panel cartoons called “Yes I Smelled It Too; Cartoons For The Slightly Off Center”. All of his books are published through Sunbury Press.(www.Sunburypress.com). In addition, many of the more than one hundred short stories Thomas has written have appeared in dozens of short story Anthologies and e-magazines. Some have been produced and presented for internet podcasts as well. Thomas is best known for the twists and surprises in his stories and his descriptive often gory passages have given him the reputation of being one who paints with words. Thomas is also an artist, musician, singer and songwriter. Tarone's 41 tales are sure to entertain – "A Pale Horse and 40 Other Tales"
Two boys trapped in a collapsing coal mine, embraced only by pitch-black darkness and the sickening squeal of timber being slowly crushed–how could anyone find humor in such a situation? Well, “George’s Priority”, the first little story in “A Pale Horse and 40 Other Tales,” does. And how could a sprout from an old sassafras stump give a life lesson from father to son? Again, a little story—titled “Sassafras”—just might do it. What of the statuesque woman whose siren-like scream of “DON’T TOUCH ME,” stopped a wedding reception cold? Even the orchestra, shocked by the scream, stopped! What was her problem? What became of her? Perhaps “Don’t Touch Me” might answer those questions. “To Kill A Friend” is a story of how beauty often attracts the ugliest of acts. 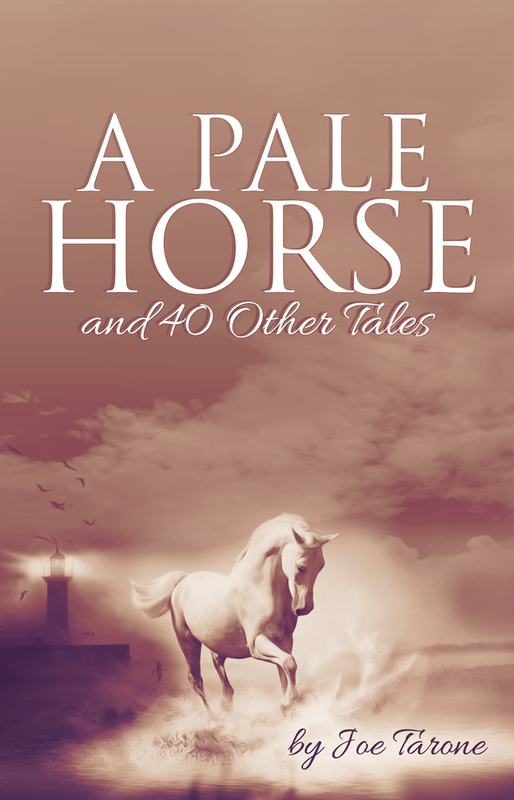 It is one of the few stories in “A Pale Horse and 40 Other Tales” that is not a happy story. Most of the others stand a good chance of making you smile. When I went to elementary school, I had to walk only three or four hundred feet to get to school—that’s how close the school was to my home. Consequently, I was able to go home for lunch. It was a part of the day that I shared alone with my mother because my dad and my Uncle Tony (who lived with us) were working, and my sister was in high school. The high school was located in a different town. Mother always had a nice lunch prepared for me. Sometimes, particularly if it was a cold day, she made potato soup. That was my favorite. My dad and my uncle operated a little mine. It was not a “bootleg hole.” Those were illegal mines on somebody’s property without the permission of the landowner. My dad and my uncle had leased the land and paid the landowner—the Girard Estate—a royalty on every ton that they mined. Their operation was completely legal. I was too young to realize how serious the mine’s squeezing was, both from a danger standpoint and from the effect it might have on our family’s income. After school that day, I told my friend George about my dad and uncle having to run out of their mine so fast that my dad left his lunch can behind. Becoming excited, George asked, “So the lunch is still in the mine?” George was always hungry and he could be very persuasive. It wasn’t very long until he had me convinced that we should retrieve the lunch can. We sneaked some candles and matches from one of our homes and off we went, down to the mine. The mine sloped downward at a very slight angle. It was open. It seemed OK. It seemed perfectly safe to us. We went in about forty feet. George was intrigued with the sound of our voices and the echo they produced bouncing off the face of the coal. He gave a loud, Tarzan-like yell. That was a mistake! The vibration that it caused was enough to make the ceiling—the top rock—fall! Darkness. Complete blackness. Total darkness. Dust that I couldn’t see, but that I felt rushing over me—clinging to me, coating me. The rush of dust-filled air had blown our candles out. It had, in fact, ripped the candle right out of my hand. Breathing was very difficult. The silence was awful. The dark and the silence—it was a living nightmare. Occasionally I heard a rock rolling from the top of the pile of fallen rock that now blocked our exit from the mine. I coughed. “Are you OK?” I asked, needing desperately to know that George was OK; that he was conscious; that I was not alone. “Can’t breathe,” I heard his weak and frightened voice say. Joe was graduated from Penn State with a degree in Finance. He lived in Philadelphia and eventually moved to Chester County to work for a small scientific instrument manufacturer which, shortly after his employment there, was acquired by Hewlett Packard. After several years in finance with HP, Joe made a major career change and became a Personnel Administrator. His first book, Some Stones Shine, depicts a decade in his father’s life in the early 20th century. In it, Tarone has succeeded in describing what life was like in a Coal Region family almost one hundred years ago. His second book, The Mega-Bite Murders, although obviously a work of fiction, inhabits an environment built upon Joe’s background in the computer and human resource areas. Caught Up In It, his third book, is a sequel to The Mega-Bite Murders. In it, two supernatural beings set out to eliminate greed in the world. Sometimes humorous, mostly serious, Caught Up In It, in it’s closing pages reveals something that could be a surprise to readers of The Mega-Bite Murders. Upon his retirement from HP, Joe returned to Pennsylvania’s Schuylkill County where he continues to write. He has served as an auditor in West Mahanoy Township, and as president of the Shenandoah Valley School Board. He now lives in Raven Run, the anthracite mining village in which he grew up. A boy is savagely disemboweled in the presence of his friends at an abandoned coal mine by an unidentified creature. During the investigation, which follows, a Philadelphia television reporter learns from an eccentric old codger a terrible legend about the disastrous history of the mine – a tale about a mine disaster many years ago in which three coal miners were trapped a mile below the surface. Out of desparation, one of the miners sold his soul to Satan in order to get revenge for the disaster. In return, Satan transformed this man into an immortal soul-feeding demon that must remain trapped in the mine until he gathers ninety-nine souls. How do you kill what can’t be killed? How do you stop the unstoppable?Welcome to a place where terror reigns, where unspeakable horror and demonic savagery is the norm; where lost souls writhe and struggle for a freedom that may never come. CAMP HILL, Pa. — Camp Hill, PA – Sunbury Press has released Thomas Malafarina’s horror short story compilation “Thirteen Nasty Endings”. It is available from the publisher and from Amazon.com and other online booksellers. This is Malafarina’s first compilation of short stories and is the second of three books contracted by Sunbury Press. 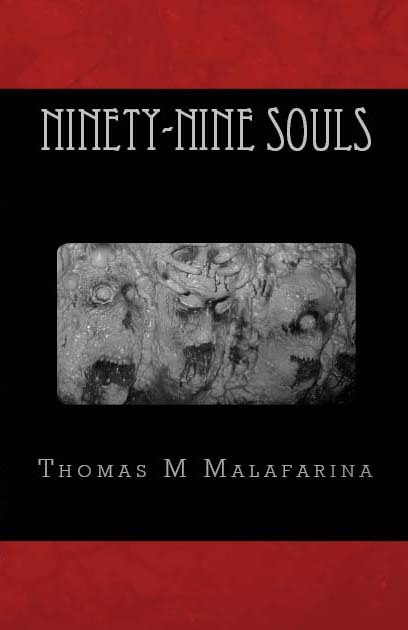 Thomas M Malafarina is a horror author from the Reading, PA area who has previously published a horror novel entitled “Ninety-Nine Souls”, also through Sunbury Press. Thomas has enjoyed a life-long love of writing, music and art and of course, horror. “Thirteen Nasty Endings” is a collection of some of his favorite and often disturbing short stories. Thomas lives in South Heidelberg Township, just outside of Wernersville, PA with his wife JoAnne. They have three grown children and three grandchildren. CAMP HILL, Pa. — Camp Hill, PA – Sunbury Press has released Thomas Malafarina’s horror novel Ninety-Nine Souls. It is available from the publisher and from Amazon.com and other online booksellers. This is Malafarina’s first novel and is the first of three books contracted by Sunbury Press. Thomas M. Malafarina was born July 23, 1955 in the town of Ashland, Pennsylvania, in the heart of the hard coal region. He was raised in a small, wood-framed row house along with his parents, his younger brother and two older sisters. Growing up in this blue-collar community Thomas learned the importance of hard work and dedication to family. These values instilled by his parents guided him through to his adult life. Thomas has enjoyed a life-long love of writing, music and art and has been intrigued by the world of horror since before elementary school. While other kids were assembling model airplanes and cars, Thomas preferred to build Aurora Universal Studios Monster models of Frankenstein’s monster, the Wolf Man, Dracula and others. While others were drawing pictures of flowers and trees, he was drawing horrible monsters. Thomas continued his love of all things horror by amassing an extensive collection of horror movies and books. Every year Thomas uses his artistic skills to create and donate a truckload or more of disturbing horror art sculptures and scenery to the Womelsdorf JC’s annual non-profit “Barn of Terror” Halloween Haunt. For many years while working as a manufacturing engineer, technical trainer and technical writer, Thomas dreamed of finding some extra time write a horror novel. 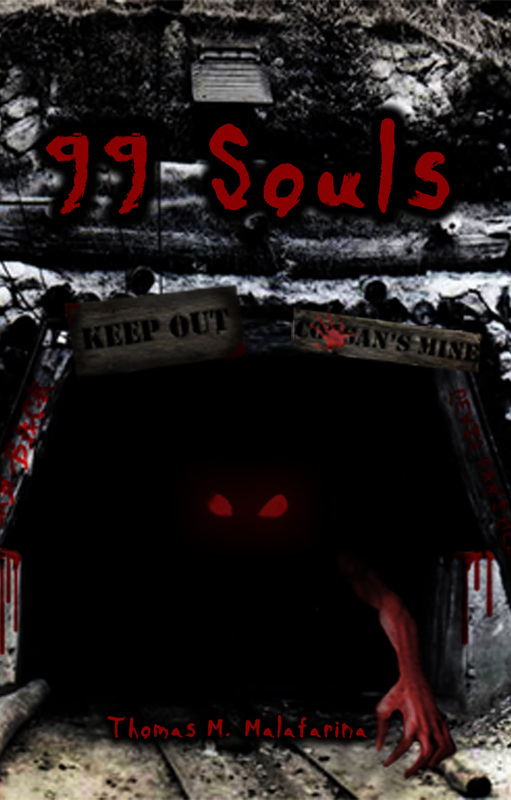 Ninety-Nine Souls is Thomas’s first book and is the culmination of that dream but signifies much more. It symbolizes a rekindled love Thomas has for writing and an enjoyment of creating horror stories that had burned deep within him unfulfilled for far too many years. Now with the flame relit, Thomas plans to produce many more works of horror fiction for the horror loving public’s enjoyment.